There is no need to write much here. The pictures explain everything. While the Iranian population are struggling to make ends meet, this is how Iranian mullahs spend the country's petro Dollars. The Islamic Republic's handwriting is all over the images. These are not just pictures of simple religious ceremonies, these are pictures of organised paramilitary forces, yet another arsenal of human ignorance at the disposal of the Iranian mullahs for their global ambitions. This is how small terror groups become terror movements. 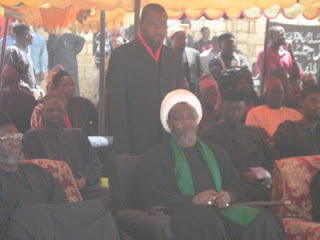 Sheikh Zakzaky is being positioned by the mullah regime as the Nasrullah of Africa. He is more dangerous than Osama bin Laden. Latin America, Africa, South Asia and South Eastern Europe are now being exploited by the criminal terrorists of Tehran. Nothing will stop these activities except a regime change in Iran. According to a former Iranian diplomat I know and who was one of the first Iranian officials to meet him, Zakzaky's followers have been trained and equipped in small arms and explosives by the Lebanese Hezbollah at a Qods Force base in Tehran. He was a mid-ranking Sunni cleric who opposed military rule in Nigeria, but converted to Shi'ism in an opportunist move to gain financial and military aid from Iran. 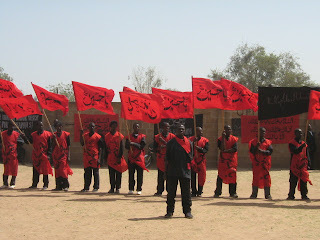 There are four uniformed "units" of Revolutionary Guards in Zakzaky's Islamic Movement, which are involved in sectarian and vigilante attacks. Zakzaky is rabidly anti-semitic - more extreme than anything I've read from the Khomeinists in Iran or even most Western neo-Nazis. He has vowed to destroy the Jewish people and, of course, this propaganda has been fed to him (for example, he says that the Nigerian political elite engages in ritual child sacrifice and cannibalism as a result of Jewish influence). Worst of all, his strongholds are universities where students are taught medicine and go on to work abroad, eg the NHS in the UK. According to the former diplomat, the Nigerian Diaspora is being used to infiltrate the West, with the creation of sleeper cells that will be awakened if Iran is attacked. Yet, the British authorities are not prepared to accept this, even though this method of infiltration was used by the Al-Qaeda operatives in the terrorist attack on Glasgow Airport last year. No-one is prepared to take action against this man, who is gaining hundreds of thousands of devoted and fanatical followers. Which country in Africa is this? Or is it several countries? ex-Nazi Kurt Waldheim. Amazing or perhaps not so amazing! No wonder Khomeini's 100th lunar birthday was celebrated at the British University, SOAS. Anon: This is Nigeria. Zakzaky's stronghold is Zaria. He is a peculiar fellow whose diatribes are, at best, unedifying. He is not a great intellect by any standards, considering the way he frequently contradicts himself and his rather basic "Islam for Idiots" understanding of religion. But in a country where the population is largely illiterate, often desperately poor and governed for long periods by corrupt and brutal regimes, populist Khomeinism and the disciplined martial style of organisation can gain purchase. 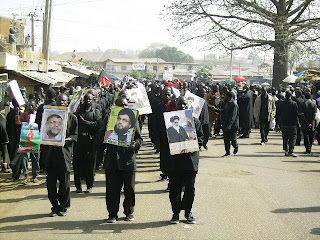 Zakzaky represents the greatest long-term threat to Nigeria's political stability, a problem that will have repurcussions throughout the world - Nigeria is a major supplier of crude to the United States. When his movement reaches critical mass and when his sponsors in Tehran deem it politically advantageous, he will unleash fanatical violence on Nigeria. I also Googled Zakzaky and read more disturbing entry. This is from Igbo group, a predominantly Christian people in Nigeria, yet they seem to admire Zakzaky. 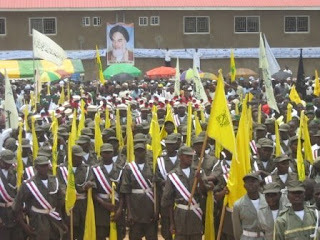 It’s an Islamic activity in Nigeria.. flags and photos were carried in support and admiration to the Islamic self determination and resistance in Lebanon. Islamic revolution is propelled by Muslim’s thirst for Justice and backed and financed by their complete submission and reliance on God, The Most High. This also establishes the connection between Muslims all over the globe. Know that “orders” come from God, from the Prophet and the Rightly Guided Leaders of Islam. This is what the Islamic determination in Islamic Iran, in occupied Arabia, in occupied Palestine, in Lebanon, in Nigeria, in America, in Canada, etc cling to. The photos shown give a glimpse of something happening to those that do not know, the Islamic Movement’s determination to change the current situation of the people and the region for good. Nigeria has a history of a successful Islamic revolution of Shehu Uthman Ibn Fodio over two hundred years ago with a well established Islamic system of governance, education, science and culture. The remnant of that were lost to the terrorists and thieves, the colonialists, that came with brute force, enslaved our people, stole our human and natural resources, killed those that resisted and occupied the region for decades. What a shame on the colonialists! Islamic revival, a movement of self-determination for our freedom is in the heart and blood of all Muslims and freedom-seeking people of the region. Any truely free-minded human will admire Islamic Republic of Iran's independence from the world's super-bully, the corporate US, and it's loyal speudo-servant states. Such independence is what the oppressed people have to squarely strive for -- a must for all religious and free-minded beings. This is where the Islamic Movement belongs and this is gradually been realised by the other religious and oppressed people in the region. Ladies and Gentlemen (hopefully) set and spread your tentacles well we are looking forward to a self determined Religious Movement that will change the miserable situation for good. IR Iran been a truely independent religious country will be one of our natural allies. The claim by Azarmehr (and his disinformative diplomatic friend) better become established, of course in the positive sense rather than the negative picture portrayed. The real terrorists are the inheritors and propagators of the historical colonialism -- Masters of Slavery and Slaughter in the name of religion. What these are doing in the present is even worst. Look at Gazza today, for those that have eyes, and see who the real "Osama bin Laden" is. We know that game Mr. So can you tell us why Islamic Republic obtained arms from Israel during the Iran-contra affair? Also does independence from AMerica justify all crime? For example China under Mao was independent from US, did that justify Mao's crimes against humanity? Also, can you give me one example where these 'religious movements' you refer to have changed the miserable situation for good? Also, why are you so scared and comment under anonymous? Islam is a religion of peace and tolerance.